Björk Guðmundsdóttir has been busy. Not content with crashing into the global mainstream as one of the most avant-garde pop artists of the last two decades, her latest project, Biophilia, transcends the word “album” entirely ; this release has become a sprawling, self-contained universe, in some ways quite literally. The drip feed of iPad apps, one for each song on the record, allows the listener to manipulate star systems as they listen, influencing the sound of the song in doing so, or wander through alien landscapes inspired by her music. Björk has consulted scientists and theoreticians as much her usual international cabal of composers, producers and musicians, and worked with groundbreaking compositional techniques. Technology has been bent into new shapes and pushed forward to accommodate her ideas, resulting in the invention of brand new instruments. And rather than touring in the traditional sense, the Biophilia live experience will take the form of “residencies” in various cities around the globe, each accompanied by an exhibition and spread over several weeks. Setting up and soundchecking the show allegedly takes three days each time. Tonight, the Biophilia circus comes to one of the larger spaces in Reykjavík’s amazing new concert hall, Harpa. Upon entering the crucible-style hall, it’s an immediately immersive experience. Eight large video screens hang above an ‘in the round’ stage construction that houses an augmented drum kit, a harpsichord, a keyboard station with so much equipment it resembles the cockpit of the Millennium Falcon, and a monolithic machine that looks something like the pendulums of an old fashioned well. All this, and a twenty-part girl choir, a tesla coil dangling from the ceiling in a glass tank, and lest we forget, Björk herself in a striking, glittering gown, bouncing around on large stack heels under a bright orange wig so large it requires a chin strap. Seven albums in, it’s easy to forget how special Björk’s voice is, but seeing her sing up close is the perfect reminder. Her face twists and grimaces, giggles and grins as she goes through the rapture of belting out each note, from that familiar childlike growl through to her breathy, maternal moans. Björk runs the gamut of emotion, drawing in the audience at every turn, and the depth of her performance brings home exactly what a committed vocalist she remains. Björk pours her whole self into her work. In contrast, the fresh-faced, all-girl choir add a sense of nervy excitement to the stage, flashing glances and smiles amongst themselves and to the audience. They dance, sometimes in unison, sometimes freely, with Björk wandering amongst them. At one point the choir surround her, closing in and concealing her as she sinks to her knees. 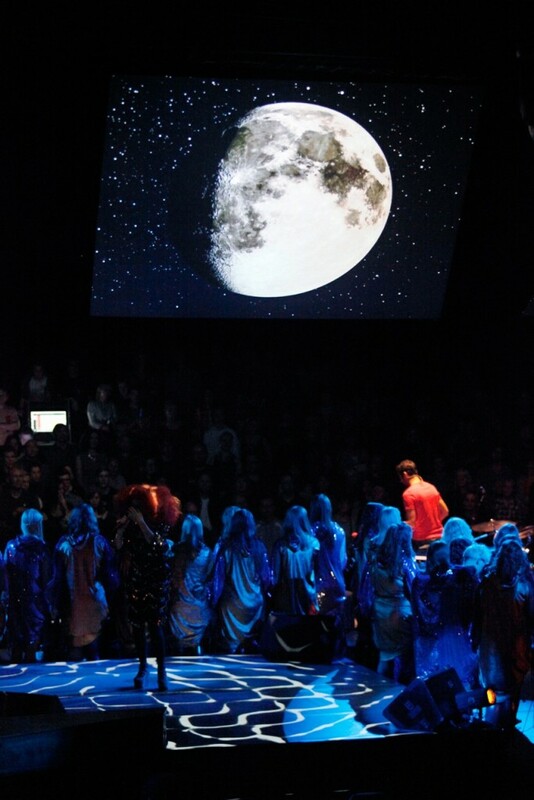 To the show’s clinking, crystalline chimes, music-box harmonics and palpitating beats, the choir lend a sense of warm humanity. Within all of this whirling stimulus and complexity, there nestles a beautiful set of songs. Moon and Crystalline are both quite sparse compositionally, engagingly melodic, even catchy. Hidden Place is graceful and powerful, and the winding, tangling tune of Mouths Cradle has never sounded better. Where Is The Line is carved out of brutal, juddering industrial arrhythmia, in direct contrast to One Day, performed in a stripped down setup on a steel-drum variant called a hang, and Björk’s vocal. The show finishes on a rousing, adrenalizing version of Declare Independence, during which the tesla coil crackles and fires spectacularly, generating pulverising bass sounds in the process. The band leave the stage to a well-deserved three minute ovation. This is wildly imaginative, creatively liberated pop music. Biophilia seems to have intimidated some critics, because the project is a leap forward for what albums can be – it seems true originality can be discomfiting for some. But the project taken as a whole is almost unfathomably ambitious construct of which music is just one facet, and it reaffirms Björk’s position as one of most creative musical minds of a generation.